The town's name derives from the Latin "Grata Aura": which alludes to the mild climate that characterizes the location throughout the year. Gradara is a municipality in the province of Pesaro-Urbino, located at the Valley Tavollo, on a hill covered by a green environment, not far from the Adriatic Sea and the border with the region of Romagna. It is the city of "Paolo and Francesca" (the lovers made famous by Dante Alighieri in canto V of the Infernus) and time seems to stand still here since the Middle Ages, as much is well preserved. 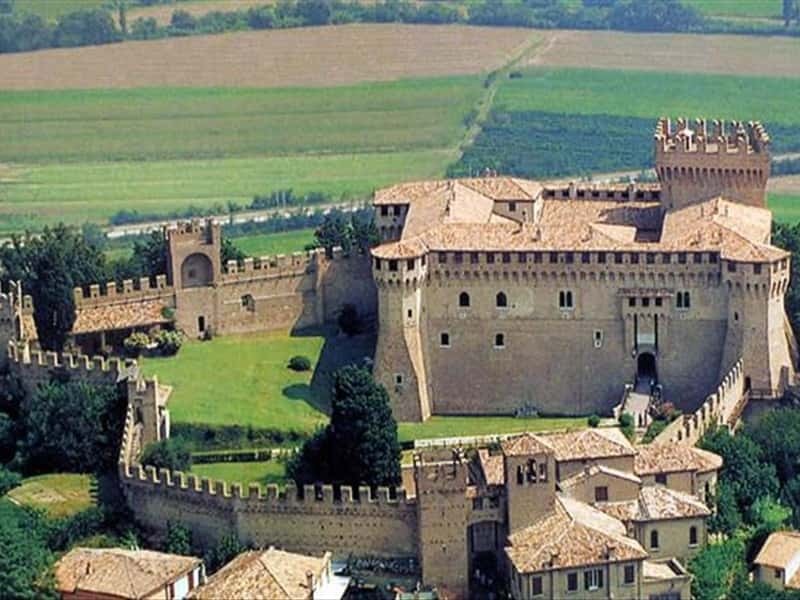 For those, that visit Gradara, it is like going back in the past, admiring the fortified walls adorned by battlements, breathing the atmosphere and the mystery of the castle with its towers and its pathways, and the charm of the many typical medieval corners of the center. The original settlement endured colonization by the Romans. At the fall of the Roman Empire, it was conquered by the Byzantines, followed by a period in which it was contended between feudal lords and bishops. From the XIII to the mid-XV centuries, the town was ruled by the Malatesta, who were responsible of the construction of the fortifications. In 1463, Gradara was ceded to Federico da Montefeltro, then to the Sforza Family and in 1513 to Cesare Borgia and the Della Rovere Family. At the death of the last heir of that house, the town returned to the Papal States. The rest of its history is similar to that of the other municipalities of the Marche Region. - the Town Hall, which houses an Art Gallery. This town web page has been visited 28,986 times.